Nissan today began deliveries of the first 100% electric, mass produced, affordable family car, the Nissan LEAF, to customers in the UK. Smooth FM DJ Mark Goodier and electronics engineer Richard Todd took delivery of their Nissan LEAFs today at Glyn Hopkin Nissan in Waltham Abbey, Hertfordshire. This groundbreaking moment represents the start of Nissan's vision of bringing sustainable mobility to the mass market in the UK. Smooth FM Radio DJ Mark Goodier has been driving electric cars for the last decade. "The great thing about electric cars is that the fuel distribution is already in place. We all have mains electricity at home. We have it at work and councils are already working on how to install thousands of charging points at the roadside. You can see why EVs make such sense, particularly in towns and cities. The LEAF is a proper full size family car with a 100 mile range* - way more than most drivers do in a day. It's everything that people like me, who have been driving electric vehicles for a long time, have been waiting for. It's going to change our lives for the better," he commented. Silicone chip designer Richard Todd from St Albans, Hertfordshire was the first customer in the UK to place his order for a Nissan LEAF when the order books opened last September. 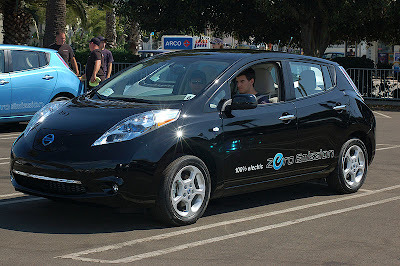 Today, he and his wife Jane took delivery of a black Nissan LEAF with the optional solar panel. "As an engineer I have always wanted an electric car - I've just had to wait for the battery technology to arrive. Hybrids are good but the driving experience of an all electric vehicle is way beyond this. Of course, the lack of emissions in town is a big positive too," he commented. "The Nissan LEAF is ideal for us as a family with the range and size being more than adequate for most of our driving needs. At evenings and weekends, we'll be using the Nissan LEAF mainly for local trips and transporting our two children between their many activities," he continued. Paul Willcox, Managing Director at Nissan Motor GB, was on hand to witness the handover of the first Nissan LEAFs in the UK. He commented: "The Nissan LEAF is pioneering the electric car revolution in the UK. We first unveiled the car in August 2009 and we've been building up to this moment for over 18 months. Today's deliveries mark the start of the introduction of the Nissan LEAF to customers across the country as our network of EV dealers will be delivering LEAFs to their pioneering customers later this week," he continued. The Nissan LEAF is currently built in Japan, but will be manufactured at Nissan's award winning plant in Sunderland from 2013. A comprehensive charging network is currently under development in the UK and Nissan's network of EV dealers - currently 26 sites across the country - will be equipped with a quick charger, which will charge the battery from zero up to 80% capacity in under 30 minutes. Across the UK there are programmes under way to install around 9,000 charge points by 2013.